Washington — In the first test of its kind, the Pentagon on Monday carried out a “salvo” intercept of an unarmed missile soaring over the Pacific, using two interceptor missiles launched from underground silos in Southern California. Both interceptors zeroed in on the target – a re-entry vehicle that had been launched 4,000 miles away atop an intercontintental-range missile, the Pentagon said. The first interceptor hit and destroyed the re-entry vehicle, which in an actual attack would contain a warhead. The second interceptor hit a secondary object, as expected, according to a statement by the Pentagon’s Missile Defense Agency. The interceptors were launched from Vandenberg Air Force Base in California. The target missile was launched from the Reagan Test Site in the Marshall Islands. Even though the missile defense system has been operating for more than a decade, this was the first time it had attempted a “salvo” intercept in which more than one interceptor missile is launched at a single target missile. The salvo concept is meant to improve the chances of hitting an incoming missile, which in actual combat could contain decoys and other measures designed to make it difficult for an interceptor to find and hit the target. Laura Grego, a senior scientist at the Union of Concerned Scientists, said before Greaves’ announcement that a successful intercept did not mean the missile defense system is fully ready to defend the U.S. in combat. She noted that the test was carried out under an unusually thick veil of secrecy. 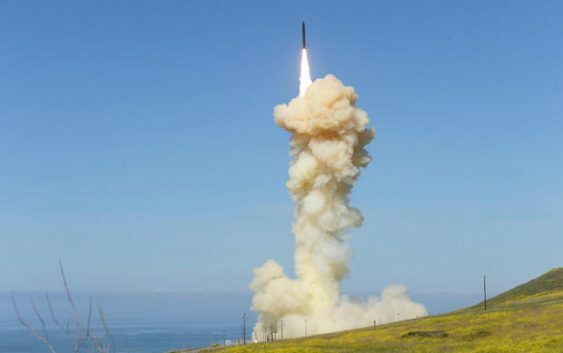 The Pentagon is putting additional billions of dollars into expanding its arsenal of missile interceptors, which are based mainly at Fort Greely in Alaska. In the 2020 defense budget request sent to Congress earlier this month, the Pentagon asked for $9.4 billion for missile defense, including the system based in Alaska.